May 2016 - Midwest Sports Publishing Network, Inc.
(North American Head Quarters) – PRINOTH, the world’s leading manufacturer of snow grooming and tracked utility vehicles, and Utility One Source Forestry Equipment, are proud to announce today a new partnership. Based in Lynchburg, VA, Utility One Source Forestry Equipment, will distribute PRINOTH OEM parts and after sales service for the Southeast USA Grooming Industry. Another subsidiary, also part of the Utility One Source Group, will eventually provide an expanded network serving the Midwest region in the near future. PRINOTH, with an already strong network in North America with six regional offices, can now count on Utility One Source Forestry Equipment to serve alpine and trail grooming customers. PRINOTH’s vehicles provide the best ski slopes for skiers and snowboarders, as well as trails for snowmobiles and cross-country skiing. “Our partnership with PRINOTH will maintain the strong brand recognition that PRINOTH has in the Southeast market while taking customer service to a whole new level that is synonymous with the Utility One Source Forestry Equipment name. The complete team looks forward to being the PRINOTH Distributor that the Southeast demands with presence in this area for parts and service,’’ stated Mr. Mark Sharman, President & CEO of Utility One Source Forestry Equipment. “PRINOTH is committed to provide the best in snow grooming equipment throughout North America. PRINOTH products are a key differentiator in providing the highest quality grooming experience. We are excited to have Utility One Source Forestry Equipment be part of our team. We are convinced that they will provide exceptional service to the Southeast snow grooming customers” said Dave Hunter, Director of Sales – Snow Grooming, PRINOTH North America. Utility One Source Forestry Equipment LLC will distribute all PRINOTH Alpine and Trail grooming OEM parts and offer after sales service. Wisconsin Rapids WI – May 19, 2016: Donahue Super Sports is celebrating 50 years in business and everyone is invited to help celebrate this milestone event on August 6, 2016 starting at 10 a.m. and lasting until 8 p.m.! Donahue Super Sports is hosting a huge party featuring a motorcycle stunt show by Team Yamaha rider Bill Dixon with show times at 11 a.m. and 1 p.m., racer autograph sessions throughout the day, and live music by Topper – an Atlanta based Classic Rock & Soul band that has been recording and touring worldwide for over 30 years! Topper Show times are 3 p.m. – 4 p.m., 5 p.m.-6 p.m. and 7 p.m.-8 p.m. under a 6000 square foot big top tent! There will also be food and beverage vendors on site along with 50th Anniversary Memorabilia T-Shirts & Hat and factory displays. A highlight of our anniversary event is a historic snowmobile and motorcycle show featuring vintage, rare, racing, popular and current models. Authentic sleds and motorcycles from the years 1966-2016 will be featured including an honorary tribute and memorial to Bob Donahue Sr. and a special dedication featuring display of his personal motorsports collection. 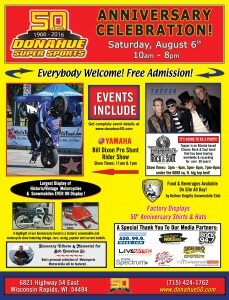 Visit www.donahue50.com for a complete and detailed list of events, sponsors, updates and more. This site will be updated weekly as we approach the Anniversary event. Have a vintage, rare, antique or non-current motorcycle that has some unique/local history and interested in displaying it to be part of this event? Fans and enthusiasts would LOVE to see your old BSA or Yamaha motorcycle or Yamaha, Ski-Doo or Moto-Ski snowmobile so call Donahue Super Sports at (715) 424-1762 with all the sled/cycle details. We anticipate snowmobile and motorcycle models of interest represented the past 50 years (1966-2016) so MANY THANKS to all owners, fans, local snowmobile/motorcycle club members and enthusiasts who are helping to make this one of the most historic display events to recognize the past 50 years of motorsports in Central Wisconsin. Donahue Super Sports, formerly known as Bob’s Yamaha City first opened its doors as Yamaha City in 1966. Bob and Alice Donahue founded Yamaha City based on the philosophy of friendly personal service and expert product knowledge. When our business was founded in 1966, Bob and Alice naturally chose industry leaders…Yamaha, Moto-Ski and BSA Motorcycles. Bombardier was added in 1983 when Moto-Ski sold to Ski-Doo. Today we continue that tradition of offering our customers the industry leaders…Yamaha Snowmobiles, ATV’s, Side x Sides, Yamaha & Star Motorcycles along with Yamaha generators. In addition to the full Yamaha line up, we offer class leading Ski-Doo snowmobiles, Can-Am ATV’s, Can-Am Side x Sides, Sea-Doo personal water craft and the Can-Am Spyder. The business has grown over the years from its humble 1800 square foot beginnings into a state of the art 55,000 square foot facility featuring Wisconsin’s largest indoor showroom, 7 factory certified technicians along with our exclusive indoor drive-through service facility. Today, the vision of Bob and Alice Donahue perseveres as the Donahue Super Sports family continues to focus on the dedication and passion to their valued customers and the communities they serve. Donahue Super Sports has also been recognized by BRP/Ski-Doo as a top performing dealer in customer care and service with the Platinum Certified Dealer recognition. Donahue Super Sports has also earned the recognition as Pro-Yamaha Motorsports specialists for achieving the highest standard in customer service and employee training. Along with the rich racing history of Donahue Super Sports – two world championships were won. The first being in 1988 as Bobby Donahue was crowned World Champion and then again in 2015 as Donahue Super Sports Racing Team member Cardell Potter won the 2015 World Championship…both riding Ski-Doo sleds. Our customers are our number one priority, without whom we could not have reached this incredible milestone. We would like to thank you, our customers, for being the lifeline of our business – we could not have done it without you. Donahue Super Sports is located at 6821 Highway 54 East, Wisconsin Rapids, WI. For more information regarding the 50th Anniversary Celebration, contact Bobby Donahue at (715) 424-1762.